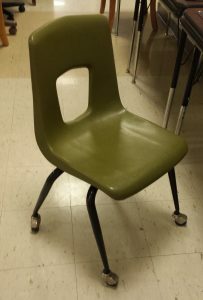 Is it…could it…can it be? Oh yes, the Spring 2017 semester is upon us. Fall and Spring semesters are different beasts. Fall brings a huge number of new, incoming students; Spring brings a huge number of soon-to-be graduates facing the final semester. In any case, we’re back and, dare I say, better than ever. Here’s a valiant group from PSY 493, a class I’m teaching that’s both writing intensive and speaking intensive. They look ready. And we professors are surely ready to do this thing that we do. 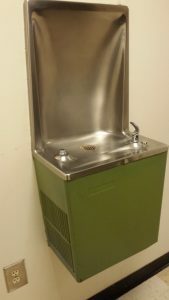 Appropriately accessorized and color-coordinated water fountain? Check. 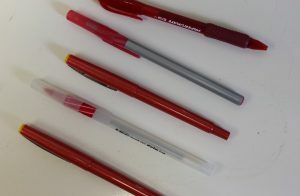 Huge stash of new red pens for marking up the PSY 493 students’ writing assignments? Most definitely a check. Have a good semester, everyone! 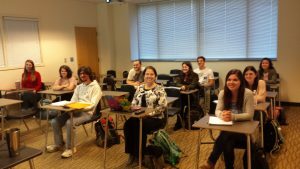 “Humans Behaving” is an informal blog run by the UNCG Department of Psychology devoted to matters large and small, from humble happenings to departmental history to our students’ many stories and successes. Have an idea for a story? Are you one of our graduates with a story to tell? Contact Paul Silvia at p_silvia@uncg.edu.